Three Off The Tee: The Spirit Of Golf - Is There Such A Thing? The Spirit Of Golf - Is There Such A Thing? Last week's shenanigans at the Solheim Cup was far from a great advert for the game of golf, especially with a decline in the number of females taking it up. There has been a huge media campaign under the "This Girl Golfs" banner (This Girl Golfs video) (Meet The Girls) and so the Solheim Cup should have been a heaven sent opportunity to show the best in the game, going head to head in fierce battle but with golf being the winner. While the opening skirmishes were tense, nothing indicated the furore that would explode at the 17th in the conclusion of the foursomes. For those that have missed it (and that's hard to do) the Americans picked up their marker on a relative short putt and assumed that the European Team player Suzann Pettersen had conceded it. Her partner Charley Hull had already moved away from the green and Pettersen wasn't close to the putt. Alison Lee the American, picked up the marker but with the putt allegedly having not been conceded therefore forfeited the hole. It sparked huge controversy, tears, recriminations and massive press coverage around the world. Having seen it, live and retrospectively, the incident has got me thinking about this so called spirit of the game and whether such a thing does and can exist in golf, both at the upper echelon of the professional game but also right back down at club golf level. Let me be very subjective. If Pettersen didn't concede the putt and she's adamant it wasn't given, then the rules of golf are very clear and the Americans lost the hole. That's irrefutable and this is where the problem begins, certainly at club level in the weekend roll up for a few quid with mates. You can't pick and choose which rules to ignore, no matter how unpalatable. However if you see your best mate unwittingly transgress in your Saturday game, how many of you will pull him up and enforce the penalty. Not many. Why spoil a good friendship and a good game, even for £5 on the game, for a minor infringement. Is this where this spirit of the game truly lies? You can see how this is opening Pandora's box. What about your monthly medal when you see your playing partner inadvertently move the ball addressing it in the rough. The rules would say there's a penalty but he's not going to beat 100 and nowhere near contention and already having a bad day. Do you ping a penalty to compound his misery. You have a duty to all the fellow competitors and so, with heavy heart, I would. You can't ignore the rules. As the dust has settled, Pettersen has issued an apology and talks about not seeing "the bigger picture" (Pettersen apology - Pettersen apology) but what is this? The US broke the rules and yes it was handled poorly immediately after the event and in the hours that followed but what bigger picture was there? 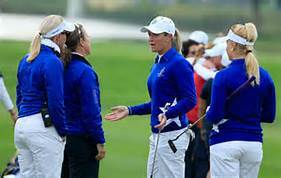 Solheim Cup controversy - but what about the "Spirit of the game?" This has been held as a banner for the spirit of the game but when you strip it down wasn't it just an illustration of supreme sportsmanship. Is this one in the same? Of course there have been examples of horrendous behaviour, with the green invasion at the Brookline Ryder Cup being perhaps the most famous. The US ran onto the green after Justin Leonard's outrageous putt from miles away all over the line of the Europeans putt for a half. Clearly no rules were broken but this spirit of the game was surely blown away. Again doesn't it simply boil down to poor sportsmanship or is this what we call the spirit of golf? It seems the Solheim Cup has previous for this sort of thing (Solheim Cup Incidents) where this spirit of the game has been held up as tarnished and where in the cold light of day things would undoubtedly have been done differently. So here's my take. "The spirit of the game places the responsibility for fair play on every player. Highly competitive is encouraged but should never sacrifice the mutual respect between players, adherence to the rules of golf, or the basic joy of playing"
Honesty, integrity and courtesy. Three words that have come to represent the spirit in which the game of golf is played. Part of that spirit sits beneath the term etiquette and part of it relates to to the rules of golf but surely the spirit goes much deeper than those two tangible items. It's something that every golfer should develop an innate sense of something that's born from golfs unparallelled history and something which lifts golf, in my own mind at least, above other sports. Whether it's through divot or pitch mark repairs, or simply a respectful silence on the tee, the spirit of the game dictates that players make sure they give others on the course, despite them effectively being opponents, a fair chance to play the best golf they can. For most of us, the game of golf is self regulation. We seldom have a referee so are reliant upon our own honest adherence to the rules to enjoy the game. As a result we are all occasionally forced to call a penalty on ourself for infringements which often go unnoticed by everyone else. It is this dependency upon honesty and courtesy that has elevated the spirit to sacrosanct status. I've played golf for over thirty years and at many of the top courses around the UK and so I am pleased to say there is such a thing as the spirit and do you know what, it is alive and in rude health. What I do know is that this spirit is perhaps unique to golf. Perhaps it's the battle between you and the course and the struggle to play as well as you can and get the handicap down. Films like the Legend of Bagger Vance seem to play up to it and romance it. I started by holding up the Solheim Cup and the "Gimmegate" incident as a missed opportunity especially for encouraging women into the game. It applies equally as much to the men's game, in fact golf in general. I'm glad the spirit of golf is there. Even as a novice, unaware of the intricate nature of the rules, struggling to break 100 and dreaming of days when I would be better, there was something unique about golf. Was that the history, the surroundings, the difficult nature of the game itself? I will never be sure but it got inside my soul and I've been hooked since. I talked about the bigger picture in Pettersen's apology and I guess this comes back to the spirit itself and mutual respect all of which were sadly lacking on that Sunday morning. To that end I feel that Alison Lee has also been at fault by not coming out and issuing an admitting she was initially at fault. I asked if there was such a thing as the spirit of the game or whether simply by playing to the rules and etiquette was one and the same thing. I am certain it is something over and above that. Perhaps intangible and unspoken it is there and needs to remain so. What do you think?